People pass through the crosswalk on Closner Blvd. between the Hidalgo County Courthouse and a parking lot Friday, March 9, 2018, in Edinburg. EDINBURG — Discussions about the new courthouse project between the city leaders here and county commissioners should resume soon now that the March primary has come and gone, taking with it some of the guesswork about the direction of the project. The discussion between both entities went awry sometime last year, when Edinburg council members said they were not sure they wanted to commit to the $30 million the previous city administration had pledged for the construction of the new courthouse. A November election in Edinburg turned the project on its head when those in the minority faction on the council gained control of the city. Since then, the new administration has been reviewing an array of agreements and projects in an effort to put their own stamp of approval on them. But despite concerns, county commissioners and the new city leaders have yet to sit down with each other to talk about the issue. 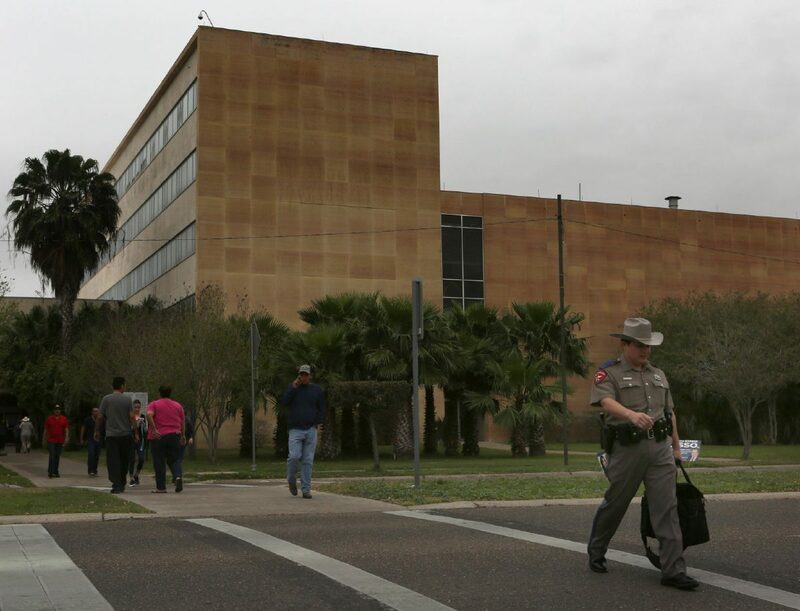 A Texas Department of Public Safety Trooper passes though the crosswalk in front of the Hidalgo County Courthouse on Friday, March 9, 2018, in Edinburg. Edinburg Mayor Richard Molina said the city continues to review its finances. “The reason we haven’t sat down with them and talked about the courthouse project with the county is that we already know what they’re asking for, but we need to make sure all of our ducks are in a row to see if we can cover this bill,” he said. The previous, nonenforceable agreement the council forged with the county said the city and the Edinburg Economic Development Corporation would split the annual $1.5 million cost to borrow $30 million. The payments would be made each year for the next 30 years, for a total investment of $45 million from the Edinburg taxpayers. But the project, set against the backdrop of the March primary, continues to pick up speed despite Edinburg’s apprehension. Commissioners have already hired a program manager, an architect and are in the process of negotiating with a builder. They hope to break ground before the end of the year. “There’s been monumental progress revolving (around) the issue with TXDoT and the closure of (Highway) 281,” county Commissioner Joseph Palacios said. 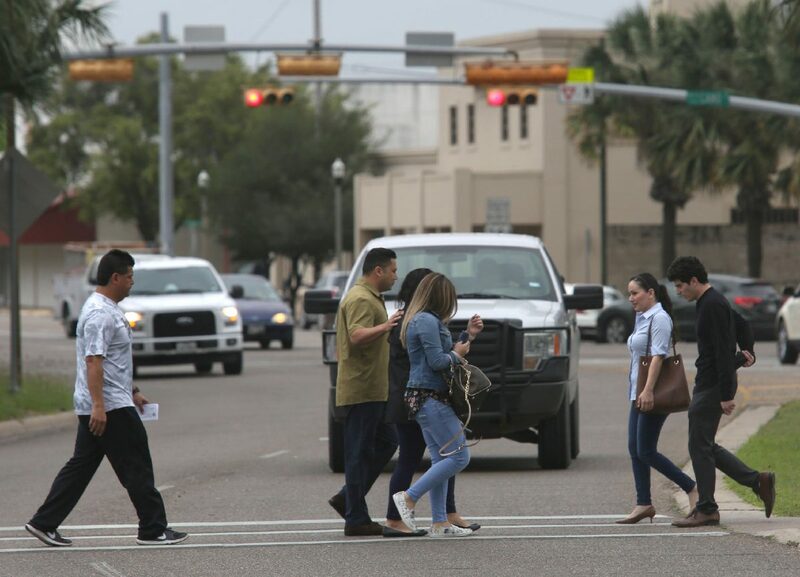 Commissioners for the Texas Department of Transportation will be meeting at the end of the month to possibly approve the county’s request to close down a portion of the federal highway, known in Edinburg as Closner Boulevard, that runs between the courthouse and its parking lot. The closure would allow the county to finalize the design of the facility, which will likely reroute the road, and get the project closer to a final price tag. “We’re very optimistic it’s going to come in way under what it was projected,” Palacios said about the $150 million estimate. Molina said he has more peace of mind knowing an ally will be on the commission come January. He helped Edinburg school Trustee Ellie Torres unseat Palacios during the primary. “I feel that our new county commissioner is going to be more transparent,” he said, taking a jab at Palacios. But the mayor worried Torres will enter the field too late to have any significant impact on the execution of the project. Palacios took issue with the mayor’s comment. Torres, who did not respond to a request for comment, previously called the project controversial during a public forum in McAllen last month and took aim at Palacios for the timing of the project. He also didn’t agree with the notion that the county should wait for the new leaders to come on board. Former McAllen Mayor Richard Cortez won the Democratic nomination for county judge last week. Cortez defeated a vocal opponent of the project, former Hidalgo County Judge Eloy Pulido, putting to rest Pulido’s threats to undo the progress of the project. Cortez, who did not respond to a request for comment, will face Edinburg businesswoman Jane Cross in the November general election. Palacios hopes both entities will be able to see past the election. “It’s easy to get lost in translation in politics,” he said. The project is too big and too important to the community to let politics get in the way, he said.